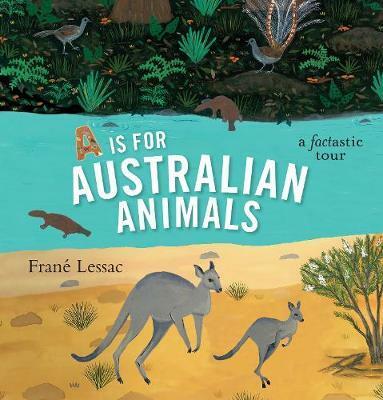 Australia has many unique animals that have been captured in Frané Lessac's book, A is for Australian Animals. This book is filled with small bites of information about 38 Australian Animals. Readers can learn about birds, reptiles, cnidarian, insects, arachnids, arthropods, and mammals that include Australia's marsupials and monotremes. What animal has a poisonous spur? What animal learns to sing songs while they sleep? What animal can make a sound like a barking dog, chainsaw and a car alarm? A is for Australian Animals is an animal tour of Australia. Readers will see Australia's most well known animals like the kangaroo and koala. They will also discover the lesser known animals; the marsupial mole and the oblong turtle. This animal discovery tour is enhanced with the inclusion of a maps of animal distribution page, enabling readers to see where each animal can be found in the wild. Remember, some of Australia's animals are quite elusive for sightseers to spot; as they move around at night, have excellent camouflage or are scarce. Lessac's illustrations show an array of Australian habitats, that uses the unique palette of the red/orange sand, yellow/brown grass and the brilliant blue skies seen in Australia. A is for Australian Animals is a Children's Book Council of Australia (CBCA) Notable Book for the 2018 Eve Pownall Award for Information Books. Its companion book A is for Australia was a CBCA Notable Book for the 2016 Eve Pownall Award for Information Books. Lessac has illustrated many of Mark Greenwood's books including: Ned Kelly and the Green Sash and Midnight: The Story of a Light Horse.